Ten-year-old Shirley Temple Wong is excited to be moving to America with her family. However, because she doesn't speak English, Shirley is ignored and feels far from home when she goes to school. After she plays stickball, she begins to follow Jackie Robinson and the Brooklyn Dodgers, learning that a minority - someone like her - can make a difference and change people's thinking. 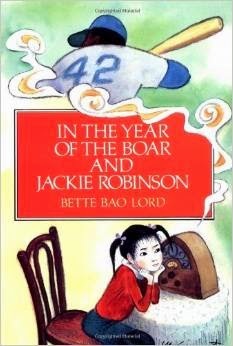 In the Year of the Boar and Jackie Robinson addresses the pre-Civil Rights Movement in America through the eyes of a young Chinese immigrant. Little Shirley sees Jackie Robinson break the color barrier in baseball, leading the charge to end segregation in America. In his story, students can see Jackie set the precedent for Rosa Parks, Martin Luther King, Jr., and the entire Civil Rights Movement -- along with the tidal wave of acceptance and equality movements to come. For our study of this book, after pre-reading activities, I would read each chapter aloud to the class (one per day). Each chapter would have its own focus. Each chapter would be followed by an activity relevant to the reading, e.g., a T-chart outlining the similarities between Shirley and Jackie Robinson; an exit ticket sharing a time when they were kind to someone; discussions about when they felt isolated, ignored, or alone; or a share of something from home that represents their culture; reflections about meeting their best friend. The unit would culminate in our connecting the book to the Civil Rights Movement -- and learning how one person can make a difference.